This card is simply amazing in a Warrior deck. Not only does it serve to draw a particular card, it also thins your deck by one card. You need to get kill something really big or some annoying face down Monster? Use Reinforcement to get your Exiled Force. Need something big to get take out your opponent's Gemini Elf? Use Reinforcement to get Goblin Attack Force. Already have a Marauding Captain in your hand? Use Reinforcement to get the 2nd one and get both out on the same turn. If your hand is flooded with Level 4 Monsters, you could also fetch Marauding Captain to speed things up a bit. Unfortunately, it does not let you get Freed. Other than that, it's a great card to have in a Warrior deck... It will be limited to 2 per deck (just like Marauding Captain). This card's main purpose is speed. It can thin out your deck and bring any level 4 warrior you want. And with the new warriors in LoD, you can pick from some versatile choices. This deck was limited to 2 in Japan I believe since it's basically a copy of every level 4 warrior monster in your deck all in one. I'd give it a 4/5 in a warrior deck. Speed is essential in the game. Not only can this get you basically any monster you want, it increases the chances that you'll draw something specific you need since you reduce your deck size. This card is very simple. Use it, search for a level 4 or lower Warrior, put it in your hand. Use it to dig out a Marauding Captain to go with the one already in your hand. Summon both of them (use one of their effects to summon the other), and your opponent can't attack ANY of your Warriors (unless Konami/UD rules differently). Use it to dig out an Exiled Force, then use any method you feel like to get it into play and watch it go BOOM. Use it to dig out a GAF, then plop it on the field and cause major pain. You get the idea. This is a very good card. Expect this to be restricted to 2. 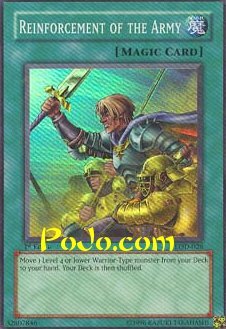 Reinforcement of the Army does two things that make it a playable card in a Warrior-Type deck. It thins out your deck and allows you to search your deck for any Warrior Monster with a Level of 4 or less. It effectively allows you to run a low amount of Monsters in a Warrior-Type deck and still be safe. Reinforcement of the Army combos very nicely with Marauding Captain if you are holding another Warrior in your hand. Besides being of great use in a Warrior-Type deck, Reinforcement of the Army is great in Clown Control. Not only can you pull out Dream Clown, but you can use it to fetch Marauding Captain to protect your Dream Clown. Works well either way if Gravity Bind is in play.